Common names: Spiny monkey-orange, green monkey orange, doringklapper, massala, morapa, umkwakw. Monkey orange is a tree indigenous to tropical and subtropical Africa which bears juicy, sweet-sour, yellow fruits containing numerous hard brown seeds. 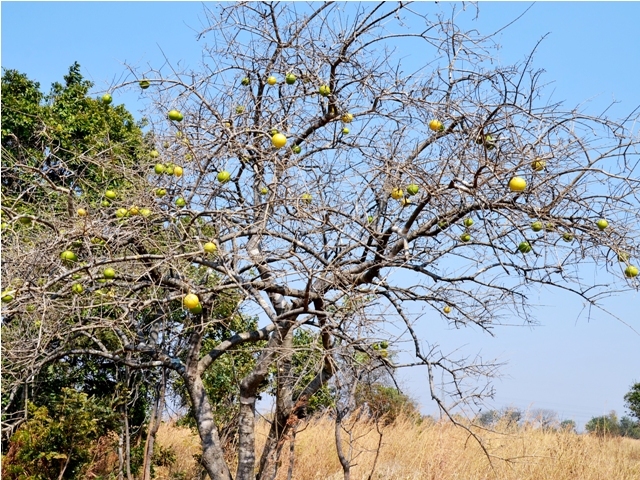 In Tropical Africa, this fruit grows in Eastern Cape to Kwazulu-Natal, Mozambique and inland to Swaziland, Zimbabwe, Northern Botswana and Northern Namibia and north to tropical Africa. This fruit has now travelled to other parts of the world too. It has recently been introduced into Israel for trial as a potential new commercial crop. Monkey orange is a thorny shrub or small tree, 1-9 m in height. Bark grey, rough, tends to flake in rectangular segments but is not deeply fissured or corky; branchlets rather pale and thin, with or without short hairs, with hooked thorns; slash yellowish with green margin. Leaves elliptic, ovate to almost circular, 1.5-9 x 1.2-7.5 cm, light to dark green and glossy at the base; veins pale green and curving along the margin; apex tapering to rounded, sometimes notched; base tapering, rounded or slightly lobed; margin entire, inclined to be wavy; petiole 2-10 mm long. Flowers creamy green, up to 6 mm long, in compact heads about 3.5-4 cm, terminal on short lateral twigs, densely crowded together on short stalks about 10 mm long. Fruit spherical, woody shelled, 5-12 cm in diameter, deep yellow to yellow-brown when mature, contains many flat seeds. Fruit is edible and is used as a supplementary source of food by rural people during times of shortage. The fruit is often sun dried as a food preserve. However, he seeds should be avoided though as they are poisonous or could have purgative effects. The wood is used for general carpentry. Timber from this tree is also used to produce implement handles, fighting sticks and hut poles. It is also used for carving. 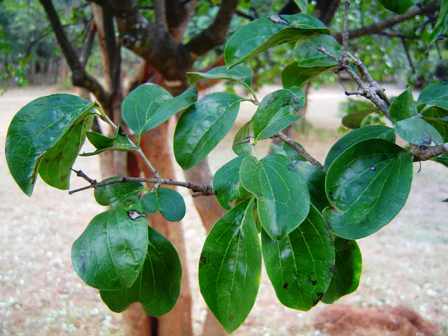 The leaves, roots and fruit (seeds) are used medicinally. Some people use root infusions as a treatment for snakebite. Others use the bark and unripe fruit. 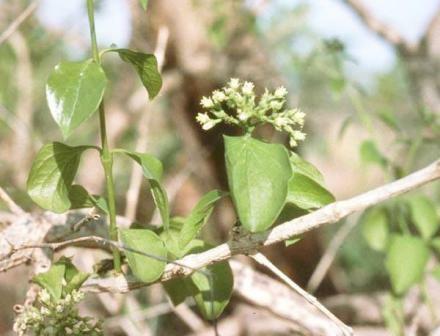 It is believed that the presence of strychnine in the bark and unripe fruit along with other alkaloids are responsible for helping overcome the venom of certain snakes, such as Mamba. A decoction of the leaf or root is used as an analgesic in Central Africa. The dried fruit, after the seeds are removed, are often used as sounding-boxes for musical instruments such as the marimba. They are also carved and sold as curios. 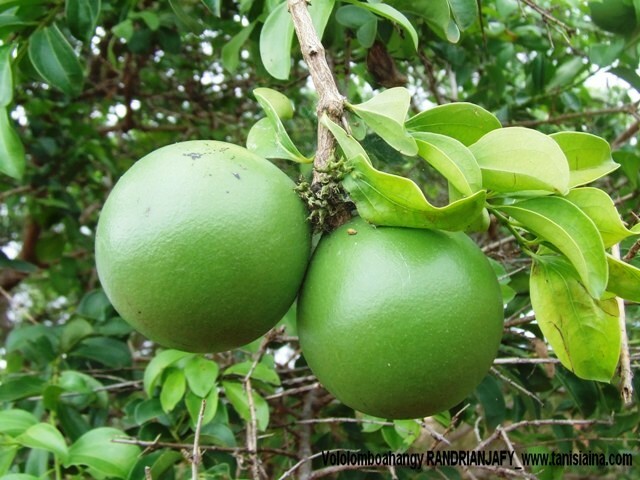 Monkey orange tree looks attractive with its dark green glossy leaves and the bright yellow fruits. Though it is a deciduous plant, but the autumn foliage, which develops an attractive yellow colour, also looks pleasant. So the plant is also quite suitable as a border or fence tree. It is quite hardy plant and can grow even in poor and rocky soils. This plant can be multiplied from seed.